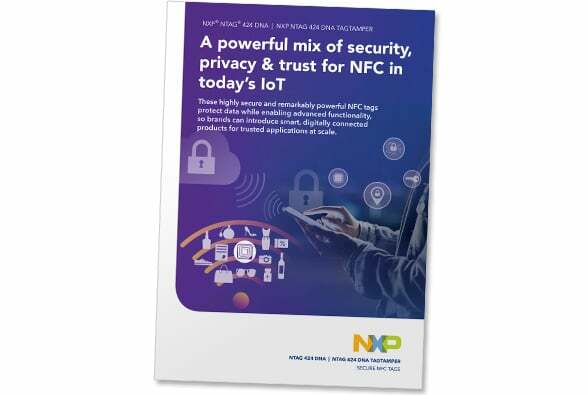 PARTNER NEWS: NXP has launched two new NFC tags that incorporate both product protection and channel authentication security features, enabling brands to take advantage of the tag reading capabilities of both Android and iOS devices to roll out NFC-based customer communication and product authentication services at scale. The NTAG 424 DNA and the NTAG 424 DNA TagTamper tags offer state-of-the-art security and privacy features including Secure Unique NFC (SUN) authentication: Each time an NTAG 424 DNA tag is tapped, it generates an authentication message which is turned into a tap-unique URL. The NFC-enabled device reads the unique URL, sends it to a server for secure tag and message authentication, and retrieves the verification result. The TagTamper version of the tag adds a tamper loop, used to detect if a product has been opened before the sale. A quick read of the tag’s status verifies that the loop is intact and confirms product integrity. “With the new NTAG 424 DNA brands can now effectively fight counterfeit and grey market activities at a cost level that allows mass market deployment of advanced NFC tags,” says the chip maker. A six-page brochure that explains the key features, benefits and applications of the new tags is now available to download from the NFC World Knowledge Centre. NXP Semiconductors N.V. today introduced its newest NTAG DNA tag chip that deliver privacy enabled, multi-layered security for NFC and IoT authentication applications. The NFC Forum-certified NTAG 424 DNA and NTAG 424 DNA TagTamper delivers cutting-edge security and privacy features, making it possible to confidently authenticate products and goods. These NFC tags provide cost-effective product protection and channel authentication for the fashion, food and beverages, pharmaceuticals, electrical appliances, and many other consumer and industrial goods markets ­– throughout the supply chain. With the new NTAG 424 DNA brands can now effectively fight counterfeit and grey market activities at a cost level that allows mass market deployment of advanced NFC tags. By securely connecting goods to the IoT with multi-layered security including privacy protection features, brands for the first time can also combat data fraud such as IP theft, tampering and data breaches. In addition, manufacturers benefit from delivering a secured and truly personalized mobile user experience that attracts, entertains and retains customers. Secure Unique NFC (SUN) message authentication for advanced tag and data protection, useable with Android and iOS mobile devices. On-chip secure data storage, accessible with 3-pass mutual authentication and encrypted data transfer. To further increase the overall system security and streamline end-to-end market implementations, the solutions include optional value-added services for trust provisioning of chip-individual AES keys, NXP’s NFC cloud authentication services support cryptographic operations and a set of purpose-built software tools for easy system integration. The new NTAG 424 DNA tag chip is expected to be displayed at the Luxepack packaging show, booth #AC-9, in Monaco between Oct 1-3.